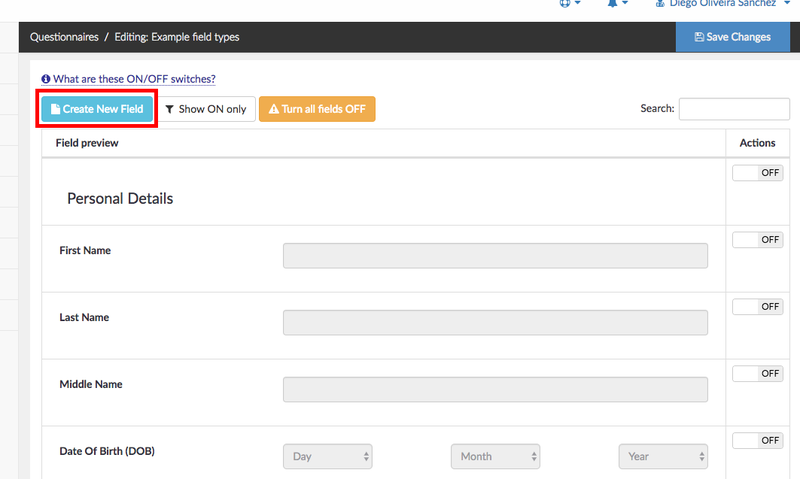 NutriAdmin allows you to add HTML content in a questionnaire as a data field. HTML is the language in which websites are constructed. Since NutriAdmin's questionnaires are presented to clients via a web browser (e.g. Chrome, Safari, etc), it is possible to add HTML content to your forms that these browsers will render when your client is entering data. Most of the time, you will want to add interactive elements in your questionnaires, such as: text boxes, tick boxes, tables, etc. However, you may want to also include static HTML elements such as images (e.g. a chart or diagram instructing your client how to describe a condition or their eating habits). Step 1: Go to Manage Questionnaires and click on the questionnaire you wish to edit. Step 2: Click on Create New Field. 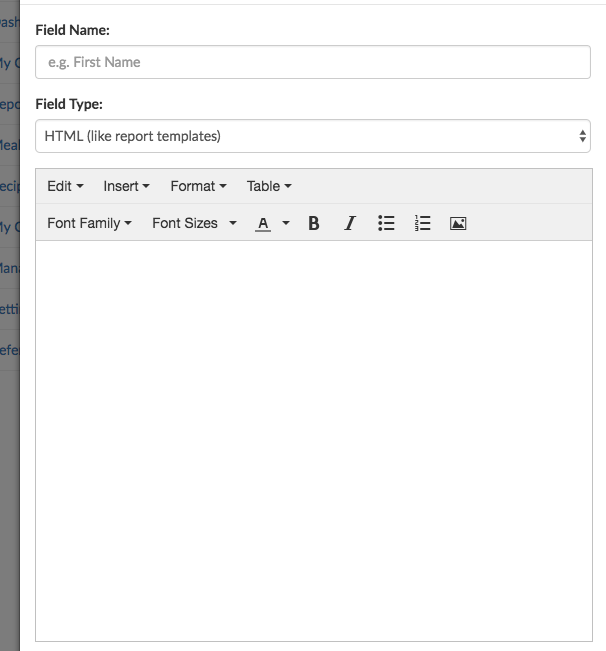 Step 3: Choose HMTL (like report templates) as a field type. This will enable the HTML editor so that you can add your content. The editor is the same as when working on reports or templates, so you should be familiar with it if you have created a report in NutriAdmin before. 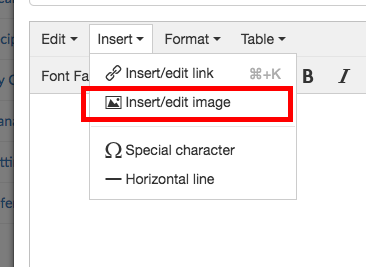 For example, to add an image, you can click on Insert > Insert/edit image. Once you are done editing your field, you can save your changes and include the field into your questionnaire as usual. 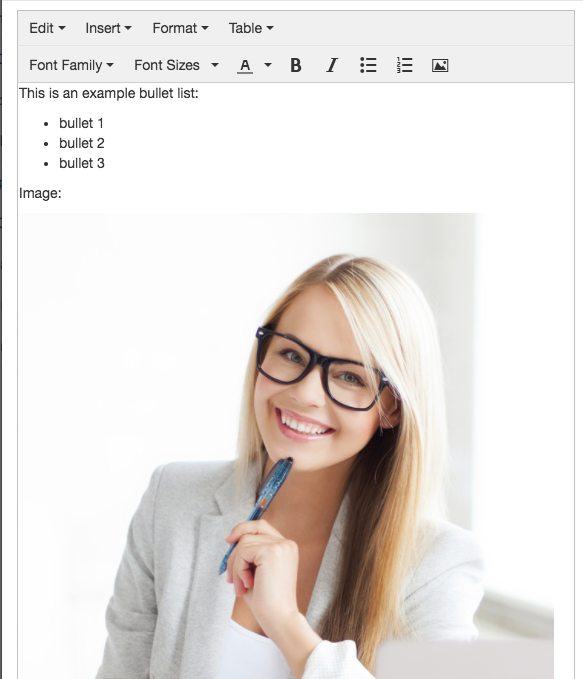 Your clients will be able to see your HTML content (including images and formatted text) next time you send them a questionnaire.